It’s Peanut Butter Nutella time! Peanut Butter Nutella time! All winter long I have been crazy for hot chocolate. Thankfully we have a helpful cookbook on our shelf called- well… Hot Chocolate. It includes many delicious chocolate drink recipes that will surely keep me happy for the rest of these evil winter months. It’s even got recipes from cafes from around the country like Frozen Hot Chocolate from Serendipity 3 in nyc, Black Bottom Hot Chocolate from Hot Chocolate in Chicago, and Skating-On-Thin-Ice Hot Chocolate from Citizen Cake in San Fran, to name a few. I had picked up a large jar of Nutella over the holidays to make some yummy thumbprint cookies. Looking to put what’s left of the jar to use, I opted to try the book’s recipe for Nutella Hot Chocolate (from the Paris Creperie in Brookline, MA). It called for 2 heaping Tbsp of Nutella per 3/4 cup whole milk. I tried it and it was really delicious, but wow did it cause a crazy sugar rush. It was a little too much for me in the AM. The next day, I made my hot chocolate with 1 1/2 Tbsp Nutella and 1 1/2 Tbsp of one of my favorite ingredients: peanut butter. It was perfect. The peanut butter didn’t overpower the Nutella, so you could still taste the chocolate and hazelnut but it’s less sweet than going full-Nutella, so I was spared a sugar headache. I highly recommend you make some. It’s a rich, indulgent treat and a fun spin on regular hot chocolate if you’re looking to try something new. There are some people that like very thin, almost watery hot chocolate and some that prefer something thicker, almost like a melted chocolate bar in a cup. I’m sort of a cross between the two; sometimes I want a hot chocolate so rich and thick that I really only need a few sips to be satisfied. Other times, I want something a little less intense so that I can slowly sip a whole cup and really savor it. This hot chocolate is kind of a cross between the two. It’s rich enough to satisfy your sweet tooth, but not so heavy that you’ll be in pain by the time you reach the bottom of your mug. And you will reach the bottom, because it is m-m-m M-M-M delicious! If you’re living somewhere where it’s “15, feels like 4 degrees” outside like it is here, then I’m guessing you might need something to help keep you warm. 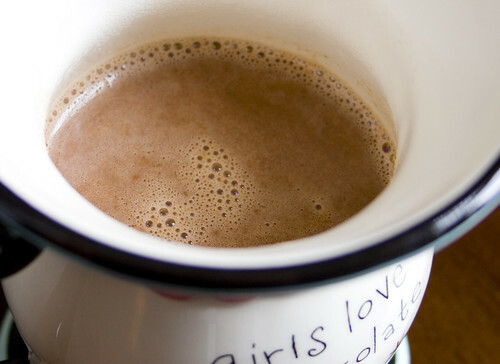 Treat yourself to a cup of Peanut Butter Nutella Hot Chocolate! Thanks to my cousin Tami for the adorably girly mug! In a small saucepan over medium-low heat, bring the milk just to a simmer (do not boil). Add the Nutella and peanut butter and stir with a whisk until thoroughly blended. Remove from heat, pour into a mug and garnish with a dollop of whipped cream. Serve immediately. Note: The creperie makes a frozen variation of this recipe the same way, but with the addition of vanilla ice cream and plain yogurt. Reader Submission: What Kind of Peanut Butter Eater Are You? Wow, just yesterday I was wondering how to make a good Nutella hot cocoa… probably because it’s frickin’ freezing outside. Thanks… can’t wait to try this! Wow! 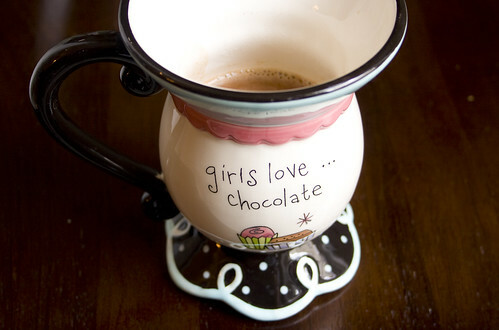 I just recently started making homemade hot chocolate and this recipe sounds perfect!. Convenient that it snowed here yesterday and I have all the ingredients for this here at home. Okay, this sounds just too delicious for words. I just made this this past weekend… OH MY GOODNESS was it delicious!